Area rugs are a tricky business: the right one can finish a space to perfection, while the wrong one can make a room feel awkward or unfinished. And considering how expensive they can be, selecting a rug is something you want to do well. There are three main elements to keep in mind when choosing the right rug for your space, so read on for tips on conquering the "rug shopping triad". Color is the obvious starting point here. If you already have a lot of color and pattern going on in your space, you might want to stick with a single-color rug, either a neutral or a shade which complements your existing furnishings. If you want a patterned rug with many shades, it's generally easier to choose it first, and add in furniture and accessories that coordinate afterwards. A beautifully textured Beni Ourain rug, spotted in Est Magazine. This is probably the most overlooked aspect when choosing a rug, but it shouldn't be. A room with a mix of different textures feels rich and layered, and an easy way to set this tone is by paying attention to the texture of your rug. There's so much more out there than cut and looped wool! Let the finishes of your existing furniture guide you, and aim for contrast. 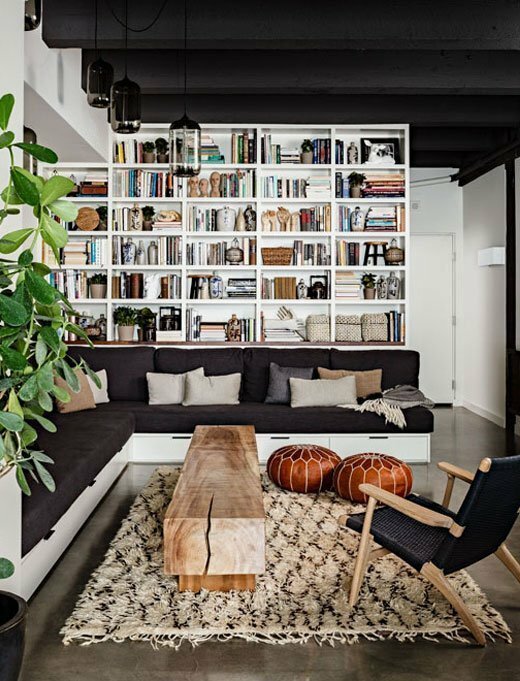 With seating in a soft fabric like velvet, something smooth and hard like a sisal might be the answer, while a sleek leather sofa looks great on something with a longer, fluffier pile. Keep in mind practicalities about cleaning the rug, and also consider whether elderly people, or those with limited mobility, will be using the area. A raised pile or shag rug can be a tripping hazard. 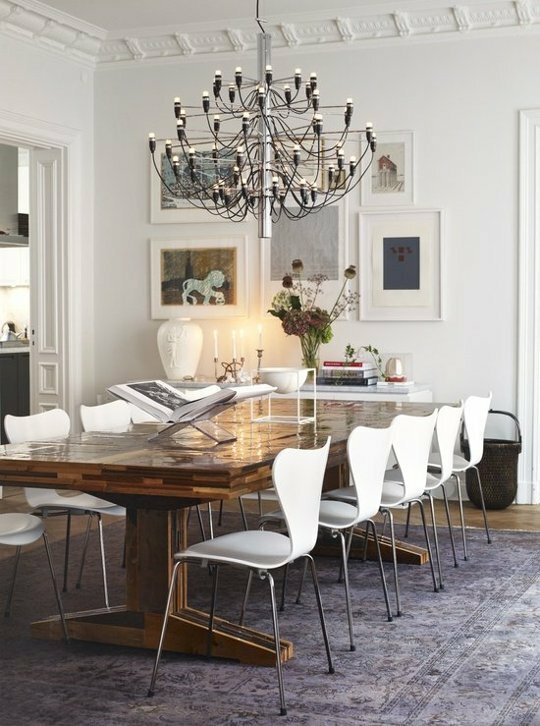 A rug that's properly sized for a dining room (like this one in a space from Skona Hem) will be large enough to pull the chairs back and have them still sitting on the rug. This is the part in the rug-choosing game where you likely know the rules, and it's usually best to play along. A rug should fit the size of your seating area (which is not necessarily the entire room) and be as large as possible within it. Ideally, all the furniture will be on the rug, but front-legs-only is a good and common compromise. The idea is that when sitting on the sofa, your feet are on fabric, not floor. Under a dining table, you want to be able to pull the chairs back and still have them sitting on the rug. When the seating area takes up the entire room (as is often the case), you also have to think about orientation: square rooms look great with square or round rugs, and rectangular rooms with rectangular rugs oriented in the same direction.